This cake is amazing! It is LOADED with pineapple and then coated in a big white cloud of frosting. Add a little coconut to drive the taste of the tropics home! This cake is so good. 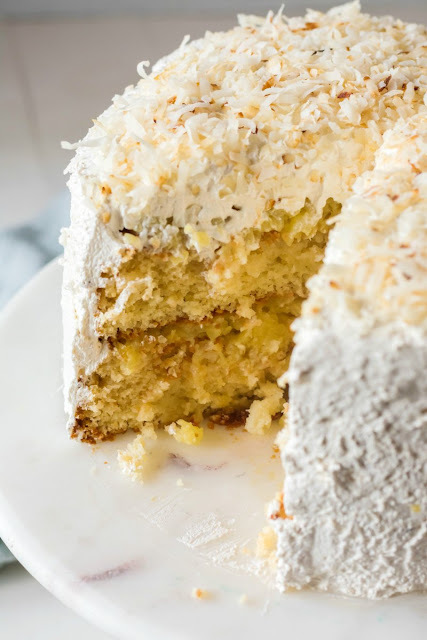 Two layers of soft white cake, a TON of pineapple filling and a white fluffy cloud of frosting. 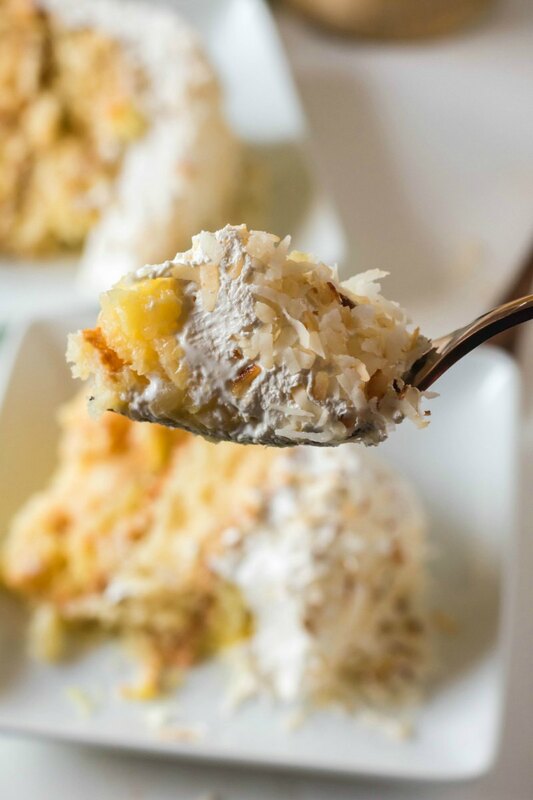 A little toasted coconut on top helps transport you to the tropics. It is a winner of a cake that will be requested time and again! My grandpa celebrated his 85th birthday earlier this month! He and grandma invited everyone over for pizza and cake. I love making desserts when I have a chance to share them with a group, so I called to see if I could bring a cake too. Of course they said yes, because who doesn't want more cake?! So I pulled out Maida's Cake Book and went to business deciding which of April's Cake Slice cakes I planned to make. Luckily the decision was pretty easy. This Haleakala Cake sounded amazing and perfectly fitting for a birthday. There is just something about layer cakes that scream "let's celebrate!" This cake was fun to make. After going the first *ahem* thirty-something years of my life never making marshmallow frosting, it seems to be a theme this year. It took more than a gallon of the good stuff to cover the star-spangled banana cake and I made some 7-minute frosting to cover some oatmeal creme pie bars I made. Now this version. To tell you the truth, this is by far my favorite version yet! It stayed so fluffy and amazing! This cake was filled with a delicious pineapple filling. 2 1/2 pounds of pineapple in one cake! I was unsure about having filling be the top layer under the frosting, but it really wasn't that hard to pull off. In the end, I did have a few tiny specks of pineapple pull through the frosting, but it was only after I really messed with the frosting trying to decide what final look to go for. Had I just frosted it and left it alone, there wouldn't have been any. As it was, I don't think anyone noticed besides me. 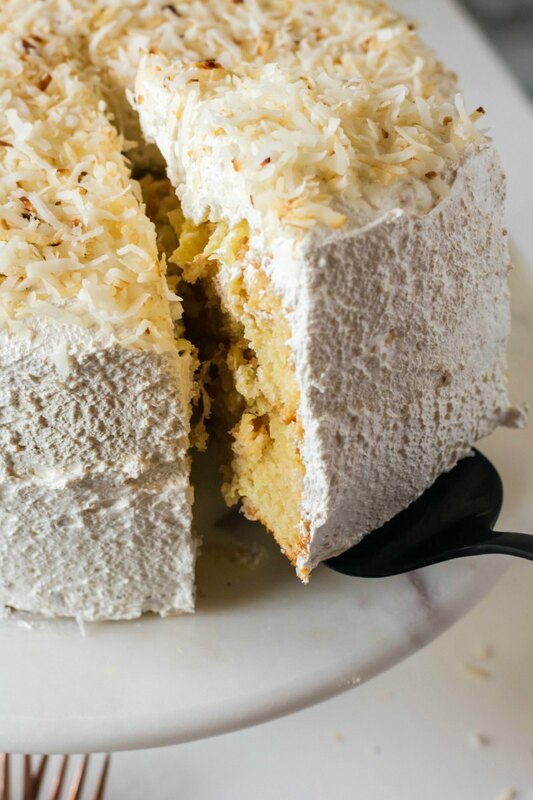 The recipe just called for putting 1/2 cup of coconut on top. I thought it would be a fun contrast in color to toast it. Plus I love the flavor toasting adds. So I just quickly toasted the coconut in a skillet on the stove before I made the frosting. By the time the cake was ready for it's topping, it had cooled and was ready to use. The cake itself is an interesting one too. It came out so moist and tender. The recipe is a bit odd in that in uses butter, milk and egg whites. The whites aren't whipped before you add them. You just toss them in as they are and crank up the mixer for a couple of minutes. I was really pleased with the crumb of the cake and wouldn't mind using this cake as a base for more great creations. If only I had more time and more excuses to make dessert! Pour pineapple into a large strainer over a bowl. Press down on the pineapple to release all of the juice. Set pineapple aside. In a large heavy-bottomed saucepan, stir together the cornstarch, sugar and salt. Add a little bit of the pineapple juice and stir to ensure there are no lumps. Add remainder of juice and stir thoroughly. Cook over medium heat, stirring constantly until mixture comes to a boil. Reduce heat and continue stirring while the mixture simmers for 2 minutes. Remove from the heat, stir in reserved pineapple, vanilla and food coloring. Cool completely and store in the refrigerator until ready to use. Add the egg whites (you add them unbeaten) and beat batter on high for 2 minutes. It is ok if the final batter isn't completely smooth. Pour half of the batter into each of the two prepared pans. Tilt them a bit to level out the batter, and then drop them from a few inches above the counter to finish leveling them. Go ahead and place the first layer of cake on your serving tray. 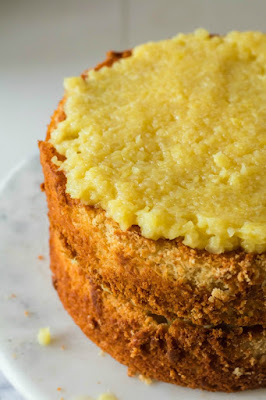 Top with half of the pineapple mixture, spreading to almost the edge of the cake. Place second layer of cake on top and finish with the rest of the pineapple. Smooth the pineapple as best you can so you will be ready when the frosting is done. In a large (at least 6 cups) saucepan, mix together sugar, cream of tartar and water with a wooden spoon. Set spoon aside so you aren't tempted to stir for a while! Uncover the pot and place your candy thermometer. Raise the heat to high and let boil without stirring until the thermometer reaches 242 F.
As the sugar is coming up to temperature, place your egg whites and salt into your clean mixer bowl. When the sugar reaches about 236 F, begin beating the egg whites until they are stiff. You want the egg whites to be freshly beaten and the sugar syrup to be ready at about the same time. Though you can always turn down the heat a bit on the syrup or turn the mixer on low for a minute or two until the other part of the icing is ready. Once syrup reaches 242 F and egg whites are ready, turn mixer to high and very gradually drizzle hot syrup into the egg whites. Hold the pan about a foot over the mixer bowl and pour in a steady stream until it is all incorporated. Beat on high for 5 more minutes. The mix should be thick and marshmallowy. Mix in vanilla until completely incorporated. The frosting is spread most easily while it is still warm, so working quickly spread a thin layer of icing around the sides of the cake. Keep adding to build it up to just over 1/2 inch thick. Then place remaining icing on top of the cake and spread until smooth. You can use the back of a spoon to form swirls and peaks if you'd like. I liked the look with more smooth sides. 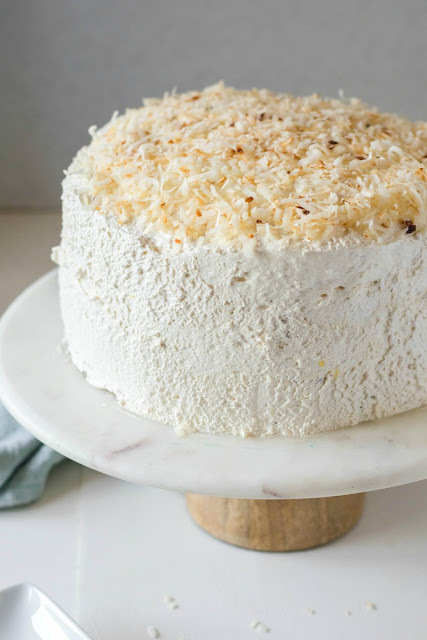 If you'd like, sprinkle your coconut on top.Let cake stand uncovered at room temperature. Wishing your grandpa a Very Happy Belated 85th Birthday! Your cake looks fabulous! What a wonderful cake. I definitely want to make this one! I hope you do, it is delicious! I love seeing the posts from you and your fellow cake slice bakers. It's fun to see how some of the bloggers can use the same recipe and yet they turned out so different. Everyone is so creative. Now that's a whopper of a cake, I'm so glad you had a perfect occasion to bake it for. I hope your grandpa and your family and friends enjoyed it. It looks wonderful Carlee. It was soooo good and so much fun to serve! Thanks, Laura! Thank you! I was really very pleased with how it came out! Carlee, the cake is beautiful! I bet your grandpa was happy. I love that the top layer is pineapple covered with the frosting. Yum!!! Thank you! I was nervous about frosting over that pineapple, but it really worked well. This is one I would definitely make again! I want more cake, I want more cake! Give me this cake every day! 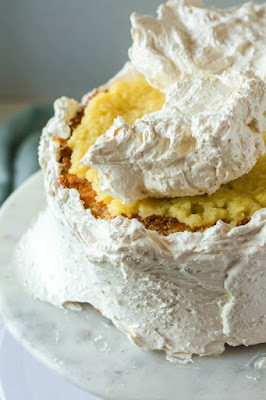 I love pineapple and this frosting looks absolutely amazing! Happy belated birthday to your precious grandpa. Ha! Me too! MOOOOOORE CAKE! I love pineapple too. My first instinct would be to say I love chocolate desserts best, but something like this definitely gives chocolate a run for its money! Thanks, Andrea! I am so happy to see how this turned out. I was curious to make it myself but wasn't able to invest that much time this month. 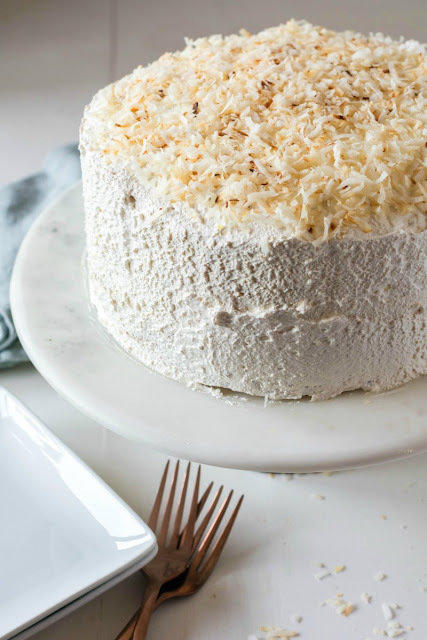 It looks delightful and I love how light and fluffy the frosting looks! We need more birthdays to celebrate! Isn't it crazy how much pineapple it takes?! It turns out so good with all of that fruit filling, but them I am a sucker for pineapple so it was a shoe-in for me! Thanks! What a great cake to celebrate your grandpa's birthday. It does sound unique but delicious. That is definitely a LOT of pineapple! Thank you! It was definitely a fun one to make and a blast to see everyone staring at it while I was serving it. I wouldn't be surprised if it gets requested again! Carlee, my mom made this cake with a lemon cake. She loved the cooked frostings. I preferred the buttercream. This looks yummy. Ooh, it would be great with lemon cake too! I am usually a buttercream girl myself, but I love to play with different techniques and textures too! So if I had all the time in the world to bake all of the delicious treats I wanted , this would be included for sure! What a beautiful and tasty way to show your love - love it Carlee! I could really use a couple more hours in the day too. Just imagine all we could get done! Maybe we should start a petition! Pineapple is one of my favorites too. I wasn't sure how it was going to work as a filling... but I am glad I gave it a go! Now this is a showstopper! I'm glad it was a crowd pleaser! And even more happy that this cake was baked up this month! I was very curious about the result! Nice job Carlee! I'm going to have to remember to bookmark this recipe for a future bake! Thank you! It was a winner in our book! What a fun party and beautiful cake! It's a new one on me but I love pineapple! Me too, and it was so good! Thank you! Wow! Visiting from another link up, and need this cake in my life, stat. I don't want to wait til I'm 85, so will have to make it soon! Definitely don't wait until you are 85, it is way too good to wait that long! I hope you give it a go! Hey Carlee! Just wanted to let you know that I'll be featuring this cake tomorrow morning on You Link It, We Make it. Thanks so much for such a great recipe! Happy Tuesday! Looks great Carlee! Pineapple cake is always a favorite! Pinning ;). Hey Carlee! This cake look absolutely delicious! Thank you for linking up at Funtastic Friday! Thank you! It was a lot of fun to make and even more fun to serve!